Furnished or unfurnished 2 bdrm! 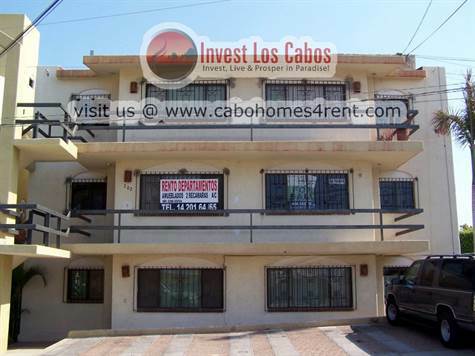 Vista del Mar, San Jose del Cabo	- This modest 2 bedroom, 1 bathroom condo is available either furnished or unfurnished. Conveniently located 1 block of the main highway, you'll find yourself minutes from grocery stores, schools, restaurants, and all of downtown San Jose. Photographed completely unfurnished, this condo has had some recent renovations including a fresh coat of paint and new varnish on the wooden doors. Available on a 6 or 12 month lease. Pets welcome. Damage deposit due at signing. 1st months rent & pagare for last month due upon occupancy. HOA and water included in rent. Tenant to pay electricity. Pets welcome.